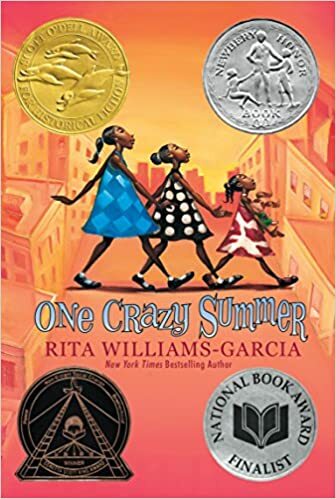 I first heard about the book One Crazy Summer, by Rita Williams-Garcia, on Ana's blog in 2014. Me being me, I read the book in 2017. So I'm a little late to the party, but the party is still excellent! One Crazy Summer is set during the summer of 1968. Delphine and her sisters are shipped from their home with their father and grandmother in Brooklyn, New York to stay with their mother (who emphatically did not want them) in Oakland, California. Their mother, Cecile, is pretty eccentric and hands-off, so Delphine and her sisters spend much of their time in a summer camp run by the Black Panthers, learning about civil rights, strength, and unity. Williams-Garcia's note at the end of the book emphasized that there were children also involved in the fight for civil rights, and this book is a brilliant way of showing that involvement. It's also about as complex as a children's novel can be about familial baggage. Cecile left her family and took off for the other side of the country. She isn't motherly or very caring at all in the book, to the extent that the resolution at the end felt a little forced to me. But as an adult reading the book, it's easy to empathize with her and her desire to make her own choices and live her own life. Serious kudos to Williams-Garcia for making Cecile a complex, complete person with her own struggles and motivations, some of which are unrelated to her role as a wife or mother or caregiver. And Delphine and her sisters are wonderful. I loved the way they stick together and then bicker and then come together again. I love how they all know each other so well but continue to surprise and challenge each other. I love that they all just got up and went to San Francisco together for a day on their own. I loved the sweetness of Delphine letting herself go one moment to scream with joy as she goes down a big hill, instead of always being the grown-up. One of my favorite things about this book is the way it portrayed the Black Panthers. This is not the paramilitary, extremist organization that many people learn about in school. It's one that provided free meals in neighborhoods and organized summer camps that taught children that they were important and valued. I read this book for a bit of lighthearted fun after so many heavy, difficult books over the past few months. It was so easy to read and so lovely, but it certainly has depth and more heart and kindness than you would expect in such a slim, quick read. I can't wait to continue the series! I am so glad you reviewed this book. I bought it for my daughter a couple years ago, but she never read it. We've done a lot of protesting together in the past few months so I'll read it with her this summer. Ooh, that would be so fun to do together! Thanks so much for the list of so many books about the Black Panthers! I want to read more about them, so I appreciate the guidance! SNAP! I just read One Crazy Summer finally this year after so long many years of intending to read it. I'm excited for us both to read the rest of the series! I'll have to add this one to my reading list! Heheh That's so relatable: I wait way too long to read all the good books too (which isn't to say that all the other good books we're reading aren't worth it too)! This one is still on my list - it might well have been Ana who nudged it on there in the first place!